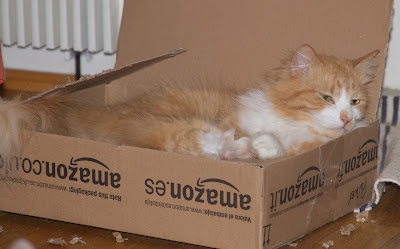 We love it when Äiti sits at the computer and orders a box for us. This one fits me beautifully, and I have room to stretch my paws. It is also of exactly the right thickness for gradual destruction. I am steadily chewing through it. Oh yes indeed; cardboard redistribution is a favourite pass time. But, as usual, I have my fun interrupted. Paksu-poika Mirsku is not welcome right now. I am not going to move out of my box for him. A quick grasp round the throat and I hope he gets the message. 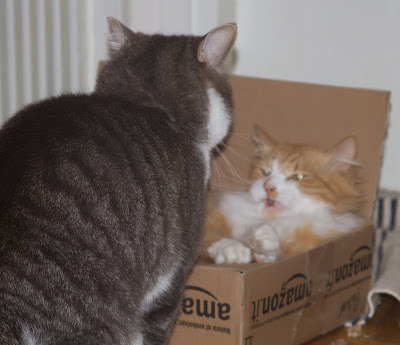 He better not crush my box! That's better. And I didn't even have to sit up. This just proves I am a worthy King Kitty Cat of Finland (North)! I am a most excellent victor. And that is a most excellent box! 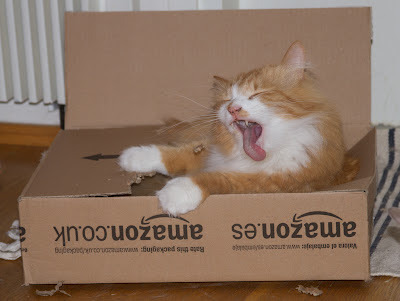 We are firstly liking that great box, but we are STUNNED by yer great tongue!!! It is indeed a box befitting a King! We are doubly blessed today by the appearance of Mirsku's mighty bum. (our Mom likes that) What a great start to the weekend! King! Very much so, if you didn't even have to sit! Nice box! And Yes, You are exellent and powerfull. Have a nice weekend! It seems to me that Mirsku is always where the action is. Just sayin'. Hei Pikku Punapippuri! Olet todellakin kingi. You are very very handsome, I instantly fell in love with you. Well, I guess that happens to you all the time. Have a nice day and don't forget the Mothering Sunday tomorrow. It's then time to give Mum a treat. A nice treat! Yes, you truly are KING, Puna-Chan! 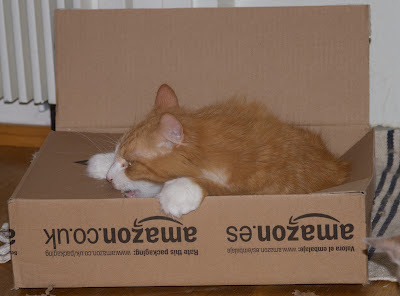 Isn't a well fitting box one of a kitty's greatest joys? We don't think this one was quite right for Mirsku. You were just trying to save him the time and effort of trying to squeeze into a too small box, isn't that right? Oh Puna, what a thoughtful boy you are. 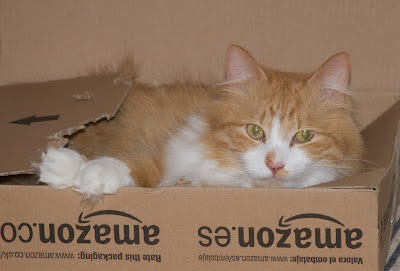 A new box... LUCKY YOU! Great cardboard flinging skills! Äiti is so kind to order such a wonderful box for you. Mirksu will have to make do with the leftovers. That is a box befitting a King! 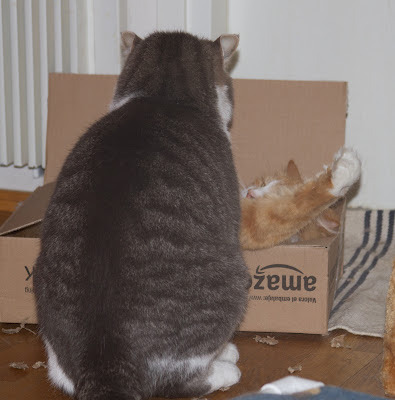 Mirsku might have to wait for Äiti to order another.